For years, pickup trucks have been very popular and lucrative product in US but growing popularity has also been recognized in other markets outside this country. In the US the largest part of sales comes from the full-size versions but since the return of the Chevy Colorado and closely related GMC Canyon, the mid-size class has started to regain its popularity. On the other hand some research has been done which suggests that there is the large population of the potential buyers which would like more compact pickup truck version. The more compact model should bring more manageable size for crowded urban areas and parking and will be more fuel-efficient and cheaper than full-size versions but will also be capable to offer larger cargo capabilities than SUVs. In that context many brands have been rumored to be considering new compact pickup versions. Among them, Chevy has been reported to be considering the return of El Camino nameplate in from of the Chevy El Camino Concept pickup truck model. This name was used for coupe utility/pickup vehicle that Chevrolet produced in 60s and until 1987. Now, Chevrolet is rumored to be bringing a new modern interpretation of the compact pickup truck which will feature the best attributes of its trucks and crossovers. 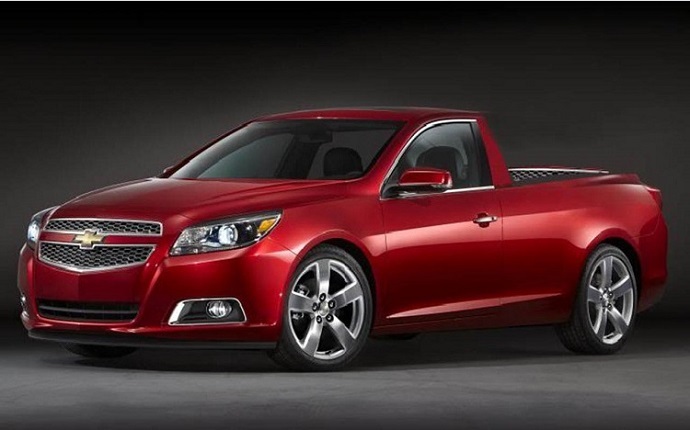 At this moment, there isn’t much information about new Chevy El Camino Concept model and its design. Some sources claim that this model might be based on the upgraded and adapted platform that underpins Holden Colorado pickup truck which is Chevrolet-badged version that is sold in the Australia. However, there is also opinion that Chevy would build this model on the unibody architecture which will ensure much more comfortable ride that is comparable with passenger-oriented vehicles. In either case this vehicle should be the most compact product in brand’s truck lineup and would get new design which will blend cues from company’s modern crossovers and trucks. It should get new grille design which is similar to the design that is found on the newest crossovers made by this company and it will also get new modern LED headlights. The model is also expected to have more subtle body lines and less-boxy appearance which is closer to the modern SUVs than pickup trucks. Interior of this model is also expected to be equipped in passenger-oriented way that should offer the comfort and features of the crossovers. It will include modern designed dashboard that is equipped with large center screen and more digital controls. Modern infotainment system will cover all requirements needed in order to provide adequate connectivity, entertainment and information features. There will also be comfortable seats and high-quality upholstery. What is also important, this model should be equipped with array of active and passive safety features that are currently featured on the passenger cars. When it comes to engines, there isn’t any concrete suggestion about possible engine options which would power new Chevy El Camino Concept model. Company might equip this model with turbodiesel four cylinder engine which would assure good fuel economy but it might also go with four-cylinder or V-6 gasoline engine. It will probably use automatic transmission and both two and four-wheel drive. Electric power steering and well-tuned suspension will provide SUV-like ride quality and model will be capable to tow and haul significant loads. As for the release date of the new Chevy El Camino Concept, there isn’t official announcement about its release and company hasn’t confirmed this project either. However, according to some reports this model may appear sometime in 2017.